V.com weekend vote: When is the last time you switched brands for one or more strings on your instrument? February 12, 2016, 1:10 PM · Despite the myriad kinds of strings out there, I most often find myself playing it safe and going with the same brand of strings on my violin, year after year. Why this reluctance? It's not all that difficult to change strings, if you don't wind up liking the ones you've tried. And the reward can be great, if you can find a different brand that works better on one or more of your strings. Some people change strings very frequently, experimenting with new combinations frequently to optimize the sound on their instrument. How about you? 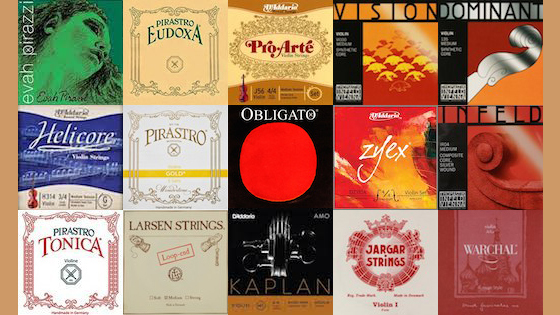 Do you try different brands and kinds of strings often? Or are you pretty set, when it comes to your strings setup? February 12, 2016 at 11:27 PM · I've never changed brand, as Pirastro Tonicas have always worked for me. Still, I'm open to trying new strings. If there are many positive reviews of a string, that will sometimes give me the incentive. A pile-up of negative reviews -- e.g., Dominant E, Oliv A -- will keep me away. Sometimes a tryout helps the process of elimination. For instance, Eudoxa regular D-G didn't serve me well when I tried them 10 years ago -- tone broke or crushed too easily. Stiff versions work much better for my type of playing. Oliv stiff D is superior to Eudoxa stiff D on my 1883 instrument. The Oliv D has power and ring on this fiddle; whereas the Eudoxa D, even the stiff version, sounded pale and dull to me by comparison. February 13, 2016 at 12:44 AM · I'm on a monthly rotation of trying new strings. The next couple months will be a viola kick. I've got 4 sets to try. Going to be fun! February 13, 2016 at 12:46 AM · I switched to Obligatos for my violin within the last five years and use them on my viola. I am certainly open to new strings, particularly cheaper ones, but the Obligatos work well for me. I came to the Obligatos for the violin after significant experimentation, so I have been there and done that. February 13, 2016 at 01:24 AM · Well I might have tried a different E string but otherwise I use Evah Pirazzi strings on my 2006 violin. February 13, 2016 at 03:21 AM · Just changed two hours ago when I finally got the inlay fingerboard and parts on the violin. I put some $6 synthetic perlon Chinese strings instead of the steel strings that came on the violin- I have another with those still- because I didn't want to spend $25 or more and discover I didn't like synthetics. So far I think I like them, but they need more rosin and better tuning, and I still don't know how much better more costly strings may be, so the jury is still out But you're right- it is quite easy to change strings on a violin, and I'll be less hesitant to do so in the future. February 13, 2016 at 04:03 AM · I've been happy with Warchal's Amytyst strings (sometimes switching out to their Russian A) but I'm just about to try their Amber line, because the spiral E seems fun. Before that, I used Larsen's Tzigane for a bit, and before that I had a bunch of various combos I kept trying. I'm lucky that I have a very modern fiddle (1994!) that's not too picky, but Dominants/Tonicas/etc. never sounded good to me. My viola is a problem still--I'm trying mixes to keep a high enough tension on the C string but keep the A string from sounding like a violin. It's an ongoing process, but at least I don't change cello strings that often! February 13, 2016 at 08:49 PM · This student fiddler has moved from Obligato to Tonica to Prim. Gonna try Vision because I suspect steel wire is hard on bow hair, and because I hear good things about Vision . . .
February 14, 2016 at 06:31 AM · I've gotten settled on two setups that I change between, depending on playing requirements. I prefer mostly to play wound gut G and D with a plain gut A and a Goldbrokat steel E. I do try different brands of gut though, although Pirastro has worked fairly well for me. For chamber music and recitals and overall playing I find it to give me the most options tonally on my current instrument. When I can't afford to let humidity and temperature dictate the range of acceptable pitch, say for musical theater or regular orchestra, I play on Kaplan Amo G/D/A, also with a Goldbrokat steel E. While higher tension than the gut set, it still has the sort of texture and response that I find appealing. February 14, 2016 at 12:25 PM · Compared to a guitar, changing strings on a violin is a real pain and I do not do it unless I have to. Violin strings are also quite expensive so I do not experiment only to find out that I do not like them....another $50 or $100 down the drain ! I like Tonicas now so I stick with them. February 14, 2016 at 10:36 PM · I recently tried Pirastro Violino on a violin for which I'd always used Obligatos. I was very pleased with the result and they were about $30.00 cheaper. However, I did use an Evah Pirazzi Gold E. Those gold E strings are special. On a different violin on which I always use metal strings I also recently switched from Heliocores to Pirastro Chromcors. Both are good brands but the Chromcors are my preference. As far as I'm concerned, one cannot go wrong with Pirastro. February 14, 2016 at 10:46 PM · On my primary instrument, I've not changed brands, but chose a different string within the brand. I've found the Dominant G-, D-, and A-strings quite satisfying on my instrument, but the E-string had been too penetrating and shrill for my violin. A year ago, I switched to Dominant's wound E-string and it's proven mellower and much more suitable for my own instrument, especially as I play in a smaller orchestra, where my tone needs to blend into full sound, not to compete with it. I must emphasize that the wound E-string has worked to alleviate a problem that I had with my violin using my skill and technique. I plan to continue using the Dominant wound E-string in the future. I use a different brand of strings for my electric violin, an NS WAV from NS Design. February 15, 2016 at 12:47 AM · I have to concur with the statement that someone above made that steel strings are surely harder on the bow horsehairs. With a little bit more playing on the $6 Chinese Perlon synthetic strings, I have to say I really LOVE them. They sound much more mellow, and I don't think I've ever heard anyone mention that synthetics are EASIER to play. At least that's what I've found with these- much less tension and easier to press down on. They'd surely be easier for students and those without very strong hands. It's wait and see on the wear of course, and I'm sure they'll need changing sooner. If I had to change more expensive ones like D'addario, I think 20 -25 dollars would well be worth it if that was once a year. I still can't compare the Chinese synthetics to anything more expensive, but I like them over nickel steel hands down! February 15, 2016 at 03:35 AM · I switched from a Pirastro Gold E to a Warchal Amber E about four months ago, trying to experiment with different colors and tones. Paired with a Dominant set of strings, the Warchal E made all the difference. It reacted really well to the other strings once it had settled, and is really a joy to play on. The string is not harsh to the fingers, and before on the Pirastro, I would often almost cut my finger due to rapid shifting. I would also have some wolf notes when trying to play open note double stops, like in the Bach d minor Sarabande. The opening chord had a tendency to be hit-or-miss, but the Warchal has fixed all of that. Even when I go to the higher positions on the E string, I can still produce a clear sound that rings nicely when playing the Mendelssohn e minor concerto or the Bach E Major Prelude. Switching notes between strings is also easier as well now. February 16, 2016 at 04:01 AM · On my main instrument I went through several brands before trying Evah Pirazzis on the advice of its maker. Had tried Tonicas, Obligatos and Infeld Blues and Reds, and resisted the Evah's because I thought they'd be too bright for that instrument, which is fairly bright to begin with but they turned out to be a great choice! Have been using them for 7 or 8 years.